While I admire the look of etched metals, I wanted a way to add images to metal without using chemicals. Once I discovered that Staz-On, unlike your typical ink pad, is designed to stamp permanently on any surface, I started experimenting with stamping on metal. For this technique, you can use any finish of metal stamping. Perfectly flat items like metal blanks like those shown here are the easiest to stamp, but it's possible to stamp on smooth, curved pieces with a little patience. 1. Clean metal thoroughly with soap and water to remove any dirt or machine oil. Dry completely. If you need to add a hole to your metal, do it now before you begin painting. Otherwise, the process of adding the hole may cause cracks or distortions in your painted surface. 2. 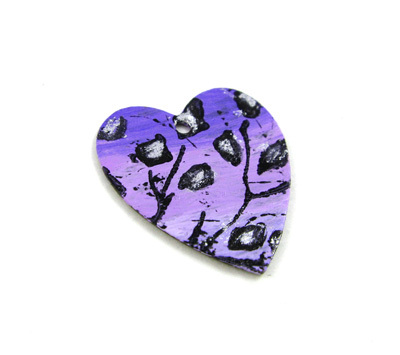 Randomly dab 2-3 colors of paint on one side of the heart. If you want more distinct colors (without blending), let each color dry before adding the next. 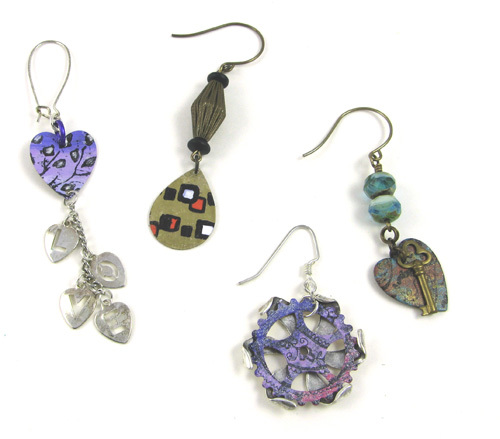 The trios of Vintaj patinas are designed to work together, but you can mix and match from different packages. Here I've chosen cinnabar (from Rusted Hardware set) and patina (from Weather Copper set). 3. Ink the stamp. Pattern stamps--leaves, paisley, polka dots, stripes--work well, since you don't need to be too precise with placement, as you would if you were stamping specific, recognizable objects. 4. 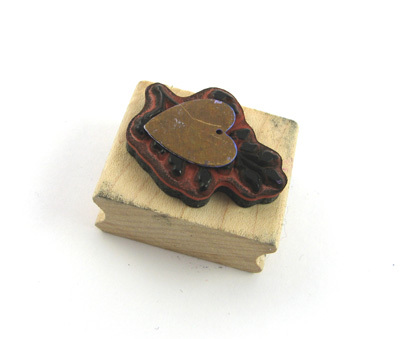 Once the patinas have dried (or you have heat set them), press the stamp into the ink and then onto the blank. Lift up the stamp up carefully so you don't smear the image. 5. 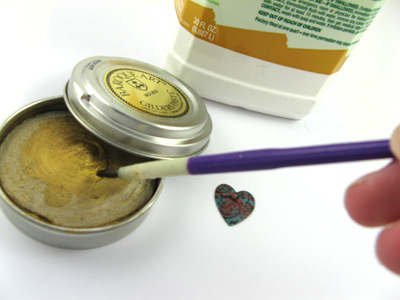 Mix a little mineral spirits with the Inca Gold Gilder's Paste to create a thin, metallic paint. Coat the entire piece. Let dry. 6. Once finished, coat with a sealant such as the Vintaj Glaze. You'll probably find it best to do 2-3 thin coats, letting each coat dry before adding the next. 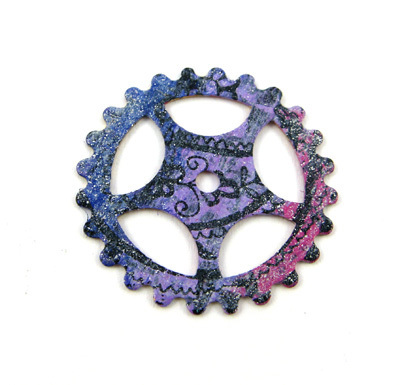 I painted the ruby (pink), opalite (purple), and cobalt stripes (from Antique Window set) on the gear and stamped with a paisley pattern. Then I mixed a little of the white and silver Gilder's Paste together. The result is a subtle, shimmery effect. 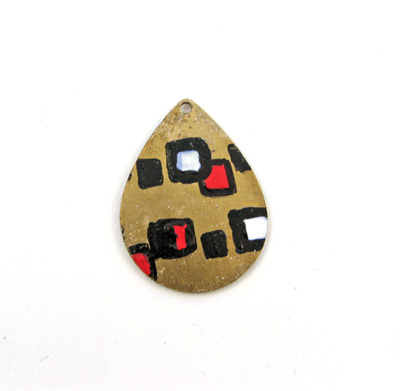 I wanted show some of the brass color, so I started by coating the teardrop with Vintaj glaze. 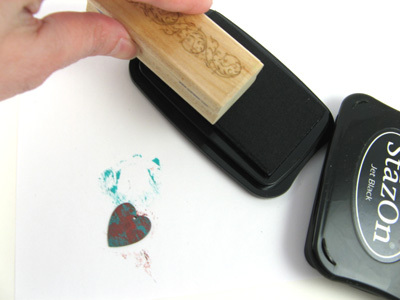 (You're more likely to create a smeared image if you try to stamp on a completely smooth surface. The glaze gives the surface a little roughness.) Next I stamped a square pattern twice across the teardrop. I colored the design with the garnet (Painted Barn set) and white patinas (Antique Window set). I used the German silver Gilder's paste to add a shimmer to the plain brass areas. This is the toughest of the techniques because every little imperfection of the stamping will show. Ombré means having colors that blend into each other. To create this version, I painted three stripes of opalite, cobalt, (Antique Window set) and white (Painted Barn set). 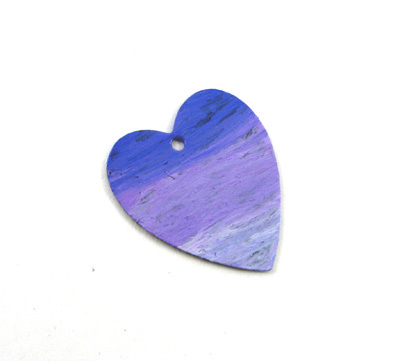 Add a tiny bit of cobalt to the opalite for a darker purple for the top stripe. (The cobalt color is very strong; use a toothpick to get the smallest drop to add.) The middle strip is almost pure opalite with a little white. The last strip is mostly white. I used a leaf stamp on top. Then I mixed silver Gilder's Paste with a little mineral spirits and used a brush to dab the paste into the centers of the leaves. For curved surfaces, you might prefer smaller stamps. Unmounted stamped (stamps not on wooden blocks) also work well since they can bend around curved surfaces. Use a toothpick with the patinas instead of a paintbrush to reach corners or other small spaces. If you want more control over the placement of a stamp, try placing the blank on top of the stamp. Layer a piece of scrap cardboard on top of the blank and then flip the stamp/cardboard over. This can also be a good method if you find that the normal way of stamping causes you to press down too hard with the stamp and smear the image. Mess up a design? 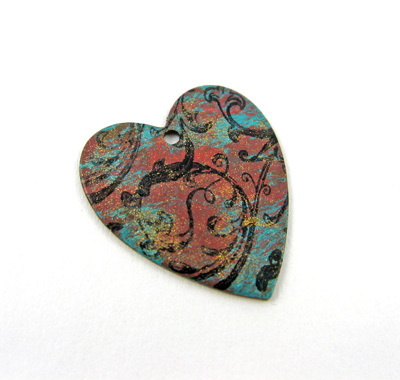 You can always paint another layer of patinas on top and try again. If it's just a stray line, I've had success using a toothpick to gently remove the extra ink. Once you have a design you like, remember to seal it.